Fruit tarts often seem like healthy dessert choices; after all, they’re made with fresh produce and offer vitamins and minerals that many other treats don’t have. It’s true that some fruit tarts uphold their healthy reputations and are low in calories. However, others that use high-calorie and high-fat ingredients in their fillings and crusts are nowhere near as nutritious. Obviously, not all fruit tarts have the same number of calories per serving. The specific count depends on a tart’s ingredients and a few other factors, including serving size. A mini fruit tart from Wegmans has 210 calories and 12 g fat, but TasteofHome.com’s white chocolate fruit tart weighs in at a whopping 342 calories and 21 g fat per slice. 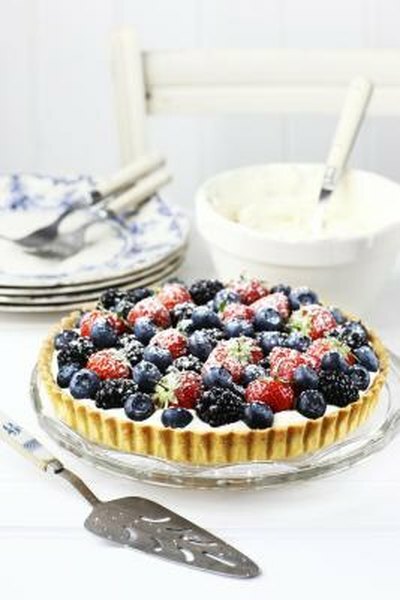 One of the slimmest options is the Fresh Fruit Tart from EatingWell.com, which has only 127 calories and 5 g fat per serving. The ingredients found in a fruit tart have the most impact on how many calories end up in the finished tart. Part of the reason that the white chocolate fruit tart from Taste of Home is so calorie-rich is because it’s made with a full package of white chocolate chips as well as heavy whipping cream, butter and full-fat cream cheese. In contrast, Eating Well’s tart is low in calories because it contains only a modest amount of butter, low-fat vanilla yogurt and a larger proportion of fresh fruit. Looking at the calorie count of a fruit tart provides useful information, but it doesn’t tell much about how healthy a slice of the tart might be. The most nutritious desserts are made with ingredients that are whole, fresh or minimally processed, such as whole-wheat pastry flour and fresh fruit rather than refined white flour or canned fruit in syrup. They also have minimal amounts of saturated fat and added, refined sugar. Additional factors that help determine calorie count include the serving size of a tart and whether it’s served alone or with an accompaniment. The recipe for white chocolate fruit tart makes 16 servings, but someone who eats a bigger slice may end up eating twice the number of calories and fat grams. Serving a piece of fruit tart with a big dollop of whipped cream or ice cream can add up to several hundred calories as well. Dozens of fruit tart recipes don’t come with calorie counts and nutritional information. If you’d like to know how many calories are in a slice of any fruit tart you make, write down the number of calories in the total amounts of each ingredient you use. Add up the totals, and divide that number by the number of slices into which you divide your tart. The result is the number of calories per serving.